The Clybourn Avenue retail corridor between North Avenue and Cortland (Armitage) has fantastic potential. Specifically, the .3 miles from Willow to Kenmore could be downright charming. The buildings are mostly beautifully refurbished buildings that used to house warehouses or light industry. They're of approximately uniform height and built close to the street, forming a nice border. There are national retailers already in place, and they must be doing a decent business, because most have been there a number of years. These include Patagonia, Talbots, Loft, Gymboree, and the Crate and Barrel outlet store, among many others. Shop windows have nice displays of merchandise. There are two major grocers: Aldi and Trader Joe's (although the TJs is hidden away, on the second floor, off of a parking garage, requiring a serpentine route to reach it on foot from Clybourn). This density of retailers is enough to make this a potentially charming destination for people strolling along for a little window shopping before popping into Frank and Dawg's for lunch. But the reality is far from it. The roadway is probably 45 or 50 feet wide, with oversized travel lanes, no median, faded striping and the usual "wild west" feel that encourages fast driving. There are no bike lanes of any kind. even on a beautiful Sunday afternoon. sidewalk space, and discourage strolling. The crosswalks for pedestrians are few and far between, all unsignalized, and the crosswalk paint is faded. Drivers rarely stop for pedestrians, instead swerving around them as they race up the street. The sidewalks are very narrow, and cluttered with parking meter boxes, parking sign posts, and street light posts. Most of these items are for the benefit of motorized vehicles, but are nevertheless placed on the sidewalk, making an already narrow walkway's effective width even narrower. There are very few trees and no flowers or other landscaping, making it feel hard, austere, sun-baked and windblown. There's nowhere to sit. Who would want to? But that's what retailers should strive to do: Create a place that people want to go to, to stroll around, to shop a while, to sit and rest. Racine, which marks the westernmost point of the very charming, pedestrian- and bicyclist-friendly Armitage retail area of Lincoln Park. That's a stretch that is on the map, literally included in Chicago guidebooks for tourists on areas to check out as a shopping and dining destination. 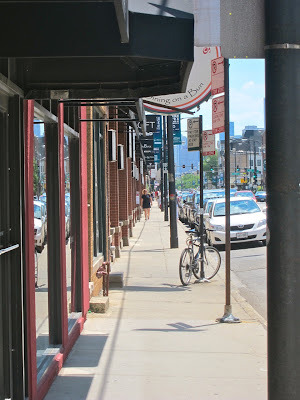 This stretch of retail on Clybourn is only a five minute walk from either the North and Clybourn Red Line stop, or the Armitage and Sheffield Brown Line stop. Yet it feels miles away. Clybourn is potentially a Crosstown Bike Route on Chicago's Streets for Cycling 2020 Plan. Area depicted above is circled on this map. Note the proximity to two El stops and the shopping district of Armitage/Halsted. But there's an opportunity for improvements. Clybourn Avenue is included on the draft Streets for Cycling 2020 Plan as a "Crosstown Bike Route", meaning it will potentially receive the highest grade of bike facilities possible, given the constraints of the street. Given the lack of bus route and the wide roadway, I'd think protected bike lanes would be a natural choice. Moving the row of parked cars over a few feet to give bicyclists the space along the sidewalk makes sense. And in doing that, the crosswalks that pedestrians have to navigate would automatically be shortened to a more reasonable distance. If I owned a shop on Clybourn, I'd lobby to make this stretch a priority route, asking that the features favoring bicyclists and pedestrians be added soon, and not in eight years. 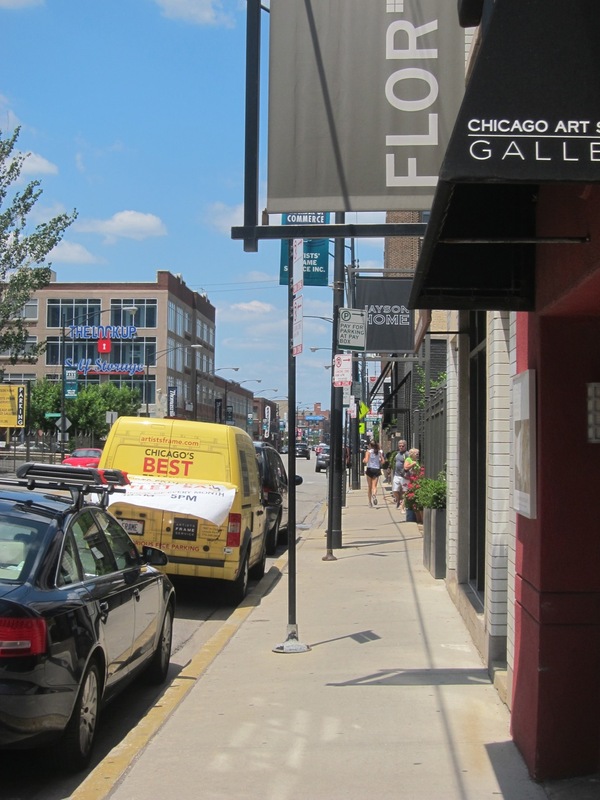 Instead of thinking of their street as a just a place for drivers, the retailers should think of it as a destination, demand improvements toward making a livable street, and then pool resources to fund a streetscape project that includes greenery and plazas. Even if the current street configuration is generating enough business to survive, they have an opportunity to thrive. That would be good for their sales receipts, and good for Lincoln Park. Follow us on Twitter @BikeWalkLP !! I would love to see some traffic calming measures and trees on this street. Everything in this post is spot-on. I'd get a rezoning to reduce the parking ratios. There are far too many people driving in the area, mainly because of too much off-street parking (Trader Joes, Goose Island). I'm a year-round bike commuter, and am am all for adding bike lanes where ever possible. That being said, I am surprised there is no CTA bus service on Clyborn or Elston. With all the retail development, I would think there would be a demand now for transit. It is quite a distance to walk to the middle sections of these diagonal streets from the existing bus stops. One thought I've had is for a pair of circular routes, one clockwise and the other counter-clockwise, running along Clyborn, Division, Elston, and Belmont (or perhaps Diversey). Connecting this type of route with Red and/or Blue Line stations would also be useful. funny, I find myself avoiding this intersection at all cost, strategically analyzing how to get to one of these stores maybe if in the next six months at some point if I am in a car in the suburbs, or taking the bus downtown. currently pondering how to get some things from Cost Plus World Market without actually coming within six blocks of the store. driving, biking, walking, it is just a mess. "Avoid" is a word I'd bet many people would use in a word-association exercise when asked about this area. That can't be good news for the retailers. or frankly, the residential areas immediately bordering it. Get rich slowly riding your bike to work!